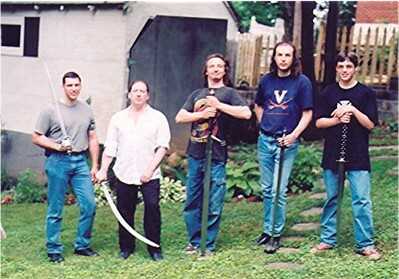 Forum Index > Off-topic Talk > 1st Annual Roanoke Valley Sword Guild gathering. 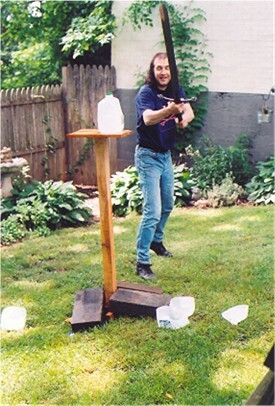 Posted: Sat 04 Jun, 2005 6:03 am Post subject: 1st Annual Roanoke Valley Sword Guild gathering. Since I was unable to attend the ATL Bladeshow this year, I decided to have a gathering/cutting party at the house today. 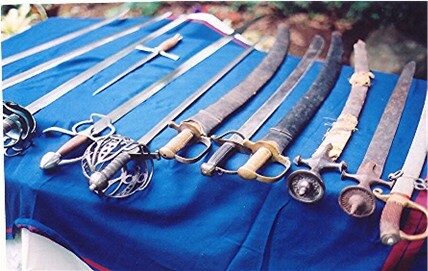 myArmoury member Chris Goerner, antique basket-hilt collector Gary Hall, blade-smith & antique blade collector Will Goodwin (no relation that we know of), my son Evan and me plan on having a cook-out, show& tell, cutting day. 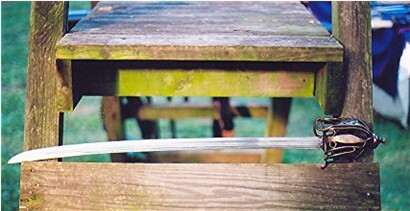 I plan taking loads of pics, so I'll post 'em just as quick as I can get them developed. Hope everyone that DID get to go to ATL is/will have a blast and safe journey back. Sounds like a blast .... wish I lived a little closer, as I would have loved to join you guys ! Would love to have your smiling face here as well. If your like me, your a bit bummed about not being able to go to ATL, but there's always next year! Nathan,Patrick and the others better take a pant load of pictures and keep us updated. What a grand day it was! Thanks to Chris Goerner, Gary Hall, Will Goodwin for coming and to my wife Jeanie & son Evan for helping prepare stuff. Have lots of pictures scanned, but , my Netzero hook-up isn't working at home, so I can't post 'em until I can get it back-up and working. 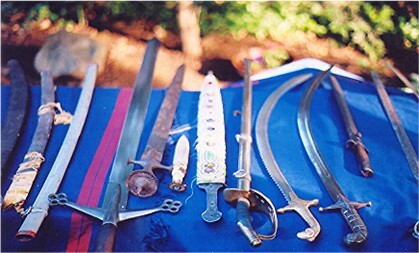 Wonderful blades were brought for use and show & tell. Chris G. brought his Madpiper basket hilt, a Vince Evans dirk, a custom clam shell hanger, and another dirk (can't remember the makers of those). Will Goodwin brought a antique Kindjal w/ hand beaded scabbard (cool), a serrated blade Shamshir (what a wicked thing it is) a custom Damascus sgian duhb he just finished making and a few other antiques. Gary Hall brought just a boat load of antique blades. 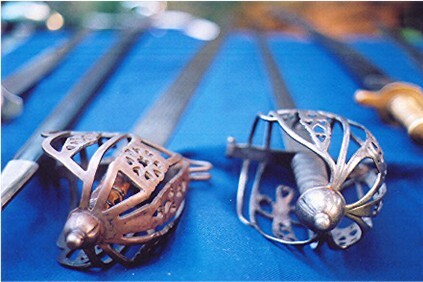 A 1740 saber blade basket-hilt (Mac have special pics of that for ya'), a basket-hilt fitted with a 1680 blade, a Del-Tin claymore (just an utter beast to swing) and just too many others to remember dates and names. Hopefully I'll have the internet problem on my home PC fixed soon. Thanks again to all who came and everyone had such a good time that we plan to make it a monthly gathering. Nathan,Patrick and the others better take a pant load of pictures and keep us updated. It sounds as though this was a really great time. I'm looking forward to seeing the pics myself. Perhaps you need a Mac instead. Thank you for a great time. You, Jeanie and Evan were most gracious hosts. The only thing better than lunch was the awesome collection of original and reproduction blades! This was my first time attempting any cutting -- I'm hooked! 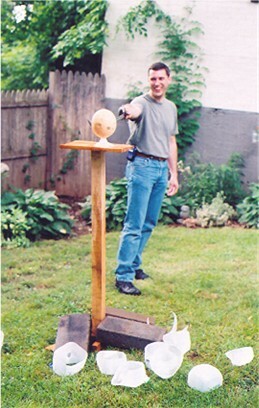 Can't wait to have my clam shell hanger sharpened up for the next event! 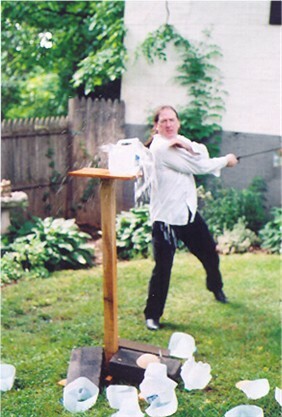 Mac -- Will is right, you would have loved that brass-basket hilted saber. She was a real beauty! 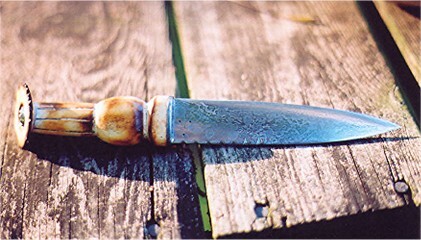 He also had a 1750's basket hilt with a reins oval that had a fascinating old repair to one of the side guards. 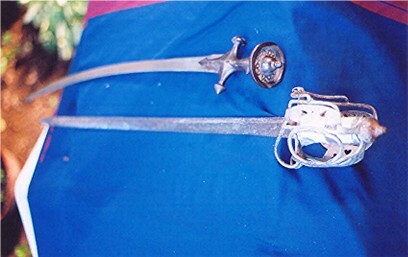 But the most intriguing piece of all was the serrated blade Shamshir. Everyone who saw it had the same reaction... "OUCH!" Thanks again for a wonderful time, Bill! Sounds like you guys had a great time ! Good job, William & family ! As I said, so glad you were a part of it and look forward to our next gathering. 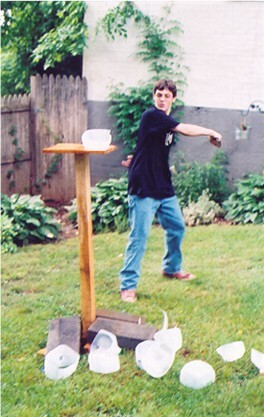 That Del-Tin claymore is still giving me goose bumps. I'm still having trouble with my computer at home (typing all this at work ) Just as soon as I can get it working properly the photos will be posted. My have to find another route to go to up load the pics I already have scanned, for it may be awhile before my Netzero program is functioning again. Ok. hope this works. I burned a CD copy of the pics I had scanned and brought them to work to use a 'puter here to up-load them. So crossing my fingers. The first two pics are of the particitants. Group as follows.... from left to right... Chris Goerner, Will Goodwin, Gary Hall, me and Evan (my son). 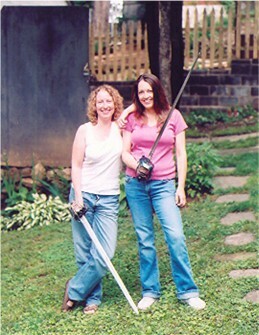 The British lassies who joined in on the cutting fun my wife Jeanie on the right and her good friend Heidi on the left. The rest of the pics I'll let them speak for themselves. Excellent photos! Nice pieces, nice setting. Looks like you folks had a blast. hú ðá æþelingas ellen fremedon." Thanks Jesse. If ya' ever make your way back up to the valley, gimme a shout. Thanks for sharing your photos with us ..... looks like everyone had great time! 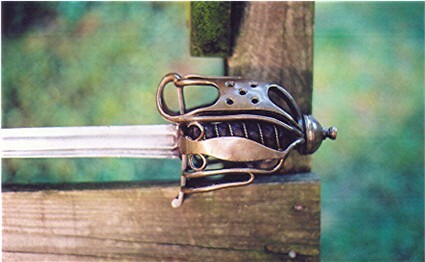 Question .... was the basket-hilt on the sabre blade made of brass or steel ? I was pretty sure it was brass but sometimes the lighting in photos can fool ya ! Thanks for letting me know for sure ! Chris is right. I saw Gary at pipe & drum practice and he verified some dates for me. 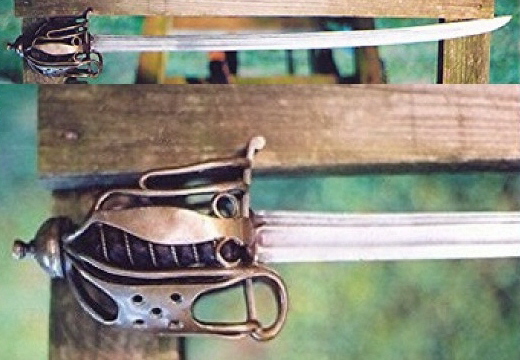 The brass basket sabre is dated around 1790, maybe a little earlier. The horsemans basket is 1750, the Tulwar in the same pic is early 1600's. 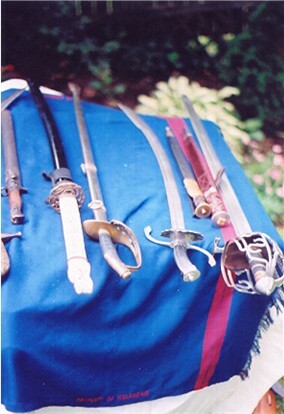 He had two others there , (on the left ) a 1828 hilt and a 1640 blade and another was 1836 (on the right). Thought you'd like these. Gary has quite a collection of antiques, especially baskets.